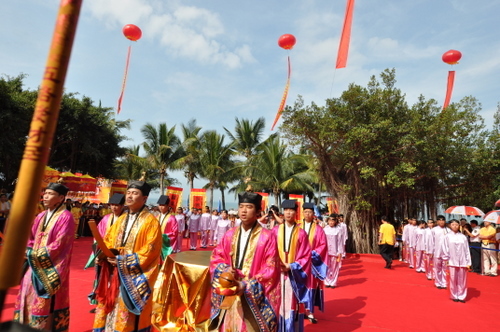 With a theme of Blessing for Nanhai Sea, Celebrating Folk Tradition, the 8th Dragon Dragons-raise-heads Festival (also known as Eryue’er Festival) will be held at Sanya Daxiaodongtian Tourism Spot on 23rd Feb, 2012. A grand ceremony to worship the great Dragons and the sea on the scenic spot of Daxiaodongtian will be the highlight of the day with over 300 local fish boats participate in the water parade on the sea. A series of provincial intangible cultural heritage items, such as Li ethnic dancing performance, man-puppet play, Qiong opera and bamboo dancing will show their appearance at the temple fair at Daxiaodongtian. In addition, the temple fair will feature a variety of specialty food and a display of folk handcrafts to show the tourists Hainan’s profound and unique folk culture.